The National Musuem lies in the grounds of the former Wang Na, the 'front palace' which was built for the second king, a sort of crown prince (Thailand has no law of primogeniture. The king traditionally named his own successor, who was often his brother rather than his son.) The post was eliminated by Rama IV and the National Museum was set up in the former palace in 1887. Note: Photography is not allowed inside any of the galleries -- which is why we don't have any photographs of the many interesting items on display inside. You enter the museum off of Sanam Luang, near the northern end furthest away from the Grand Palace. The ticket booth and check room is at the far left of the parking area as you enter. Nearest the ticket booth is the Gallery of Thai History. This gallery starts with the prehistory of Thailand, and takes you through the early kingdoms such as Lanna and Sukhothai, through to Ayutthaya and finally to the modern Thai kingdom established in Bangkok. 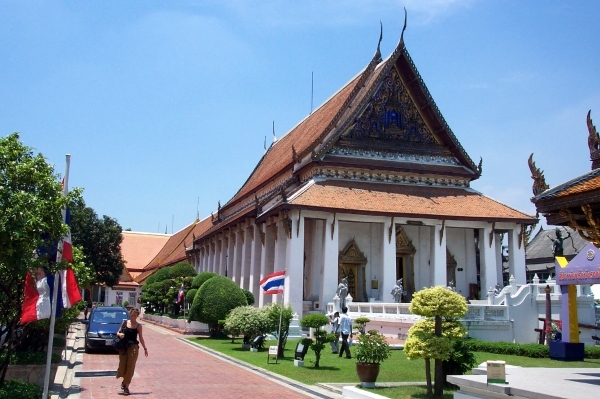 Next to the Gallery of Thai History is the palace's original reception hall, called Phra Thinung Phutthaisawan. Now converted to a Buddhist prayer hall (wiharn) it houses yet another copy of the much-loved Phra Singh Buddha images, which can also be found in temples in Chiang Mai, Chiang Rai and Nakorn Si Thammarat. Unusually, the altar holding the Buddha image is in the center of the Wiharn, where the throne for the second king once stood, rather than at the back. Behind it are several large storage cases for scriptures. Behind the chapel is the palace building proper. Front-most is another Throne Hall, now used for special exhibitions. Behind this are the living quarters, which are divided into a series of apartments giving on to courtyards. The design helped to keep the palace livable all year round. Each of the large halls now displays artifacts on a different subject. You'll find galleries devoted to musical instruments, khon masks, clothing, royal stele and a complete armory of armaments. South of the palace building is the 'red house' Tamnak Daeng. This airy teak house was stained red, hence its name. The residence was originally built within the Grand Palace in the late 18th century for a sister of King Rama I. It was later moved to Thonburi Palace and then to Wang Na Palace by one of Rama II's sons when he became Second King to Rama IV. Between the red house and the old palace building is one of many beautiful pavilions bought to the museum from other palaces. 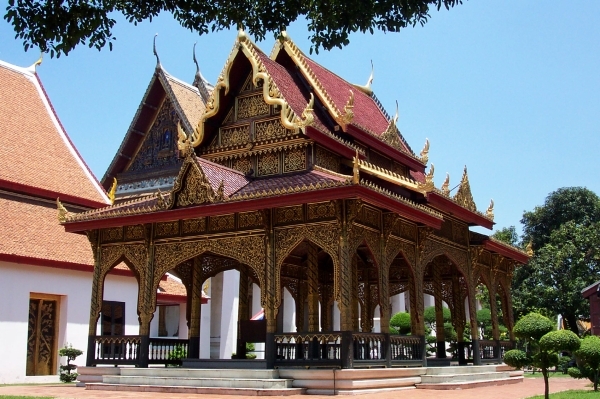 This one features delicate fretwork in a Moorish design, topped by a very traditional Thai-style roof. North of the palace building is the modern building housing the huge elaborate ceremonial chariots. These chariots are used almost exclusively for royal cremations. The last time they were used was for the much-loved Princess Mother's funeral in 1996, which makes the gallery a rather melancholy experience for us who were here at the time. There's even a video of the funeral procession, which actually took all day to travel from the Grand Palace to the crematorium which had been erected on Sanam Luang. The video gives you an idea of how the elaborate mechanisms worked for raising and lowering the casket (which is also on display) to the high platforms of the chariots, which were pulled by hundreds of soldiers in uniform. The admission fee for non-Thais is 200 Baht (5.19 USD). The museum is open Wednesday to Sunday from 9:00 am to 4:00 pm. The last ticket is sold at 3:30 pm. The museum is generally closed on national holidays. Free guided tours are conducted by the National Museum Volunteers at 9:30 a.m. in English and French on Wednesdays and Thursdays, in Japanese on Wednesdays only, and in German on Thursdays only.